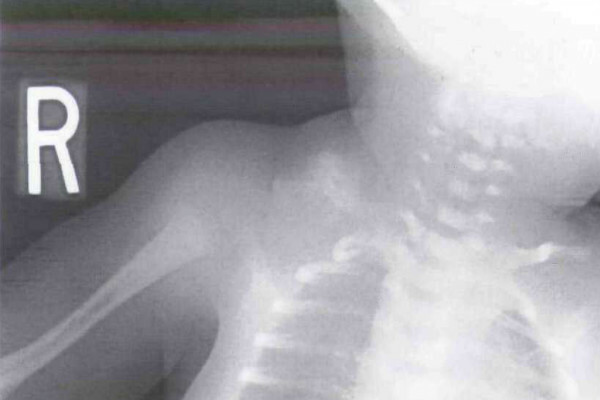 A 9-month-old boy was evaluated for a recurrent lump on his right clavicle. 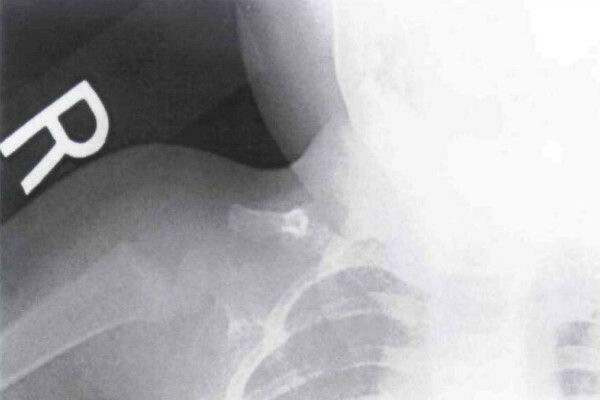 His medical history was significant for a fracture of the right mid-clavicle diagnosed at 2 weeks of age via a radiograph (Figure 1) when the mother noticed an asymptomatic lump in the clavicular area. The child was born via a normal, spontaneous vaginal delivery at a weight of. He lived at home with his mother, father, and two healthy, well-appearing older siblings. At this 9-month visit, his physical examination was completely normal, except for a small, firm, slightly tender protuberance of his right mid-clavicle. A radiograph revealed a lucency extending from the superior cortex to the inferior cortex of the clavicle, consistent with a new fracture (Figure 2). This new fracture was just medial to the area of the previously healed perinatal fracture. The boy had recently begun to pull to stand and ambulate while holding onto a low table. His caregivers did not witness one specific severe fall by the boy, but did witness multiple seemingly insignificant falls in which he could have fallen against die table or a toy. Due to the infant's young age and the fact that no definitive cause of the second fracture was determined, the child was admitted to the hospital for further evaluation. A skeletal survey revealed no other bony abnormalities except for the previously stated clavicle findings. An investigation by Child Protective Services concluded that intentional injury was unlikely to be the cause of the fractured clavicle. The most plausible explanation was that the perinatally injured clavicle may have been at increased risk of fracturing, and a fall onto the shoulder by the newly ambulating toddler caused the refracture. Another radiograph obtained 2 weeks after the discovery of the second clavicle fracture showed development of a callus in the affected area (Figure 3). Figure 1. 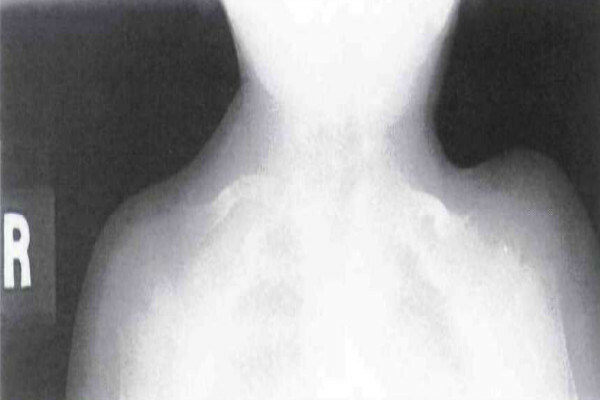 Periosteal reaction surrounding a midshaft fracture of the right clavicle (patient at 2 weeks of age).